To begin managing a new project, you will need to define the individual Tasks that must be completed to deliver it. The default view for a new project in ConceptDraw PROJECT is the Gantt Chart. 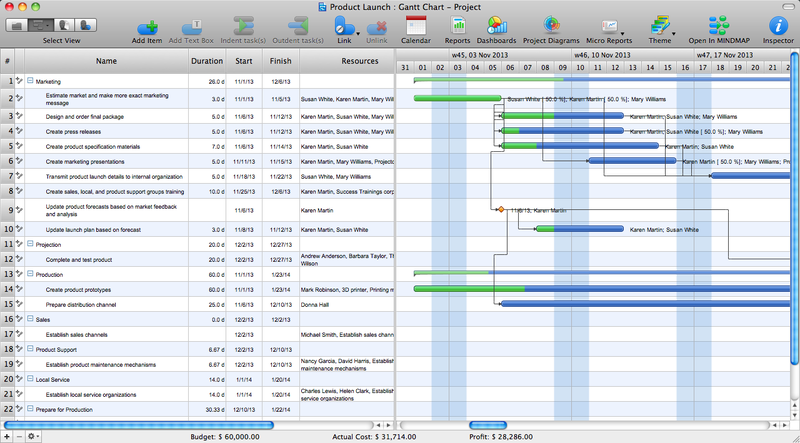 The left pane of a Gantt chart displays a list of project Tasks. The right pane displays a calendar and timeline of those tasks. Pic. 1. ConceptDraw PROJECT - Gantt chart view. The first step in planning a new project is to create a list of the different tasks and phases in your project. There are several ways to add tasks to your Gantt Chart. The simplest way it to press the Add button on the toolbar. You can also press the Enter key on your keyboard. The Gantt Chart table has columns for all of your project data, like task name, start and finish dates, duration, and completion level. Name the Task, and assign its duration. You can do so by double-clicking on the fields in the left pane of the Gantt chart, and then typing on your keyboard. Or simply drag and drop your tasks in the right pane of the Gantt chart to where you want them. You can also easily change a task’s start and finish dates. Either manually enter the data into the table, or drag the edge of the task to lengthen or shrink it in the graphical timeline view. Group Tasks into Phases. Use the Indent button create project phases on the Home toolbar to subordinate a Task, thereby making the dominant item into a Phase. To establish a relationship between Tasks, select two or more Tasks on the Gantt chart, and then click the Link button to link project tasks on the toolbar. The Gantt Chart also allows you to indicate a task’s priority level. Task colors can be used to highlight your tasks to draw attention to certain sections of your project. You can also learn how to further manage the project task list. Assess time characteristics to a project. Display links between scheduled tasks. Display results of changes made to task activities. Show links and relationships between scheduled tasks. During the planning, discussing and execution of a project you may need to prepare a presentation using project views such as the Gantt Chart, Multiproject Dashboard or Resource Usage View. It’s easy do with ConceptDraw PROJECT v9! ConceptDraw PROJECT v9’s powerful reporting engine lets you generate a set of tabular reports with just one click, or visualize your project as Radial Tasks Structures, Work Breakdown Structures and Resource Calendars. It also provides you with dynamic Project Dashboards. ConceptDraw PROJECT v9 is simple project scheduling software delivering the full range of classic project reports about statuses and resorces usage. Learn how features of project gantt charts works in simple ConceptDraw PROJECT v9 scheduling software, how to export project management dashboard in excel representation. ConceptDraw PROJECT v9 is the Gantt chart software that implements critical path method to provide the user with a wide set of project management tools.